I mentioned yesterday that Jen and her family came over for dinner on Friday night. I wanted to plan a fun and low-key evening so that we could all just enjoy, relax and unwind from the week. Because of this I wanted to make sure everything I was cooking or making could be done ahead of time, except for the Mr. grilling our burgers. I flipped through my cookbook and decided that I hadn't made one of my favorite side dishes in a while. 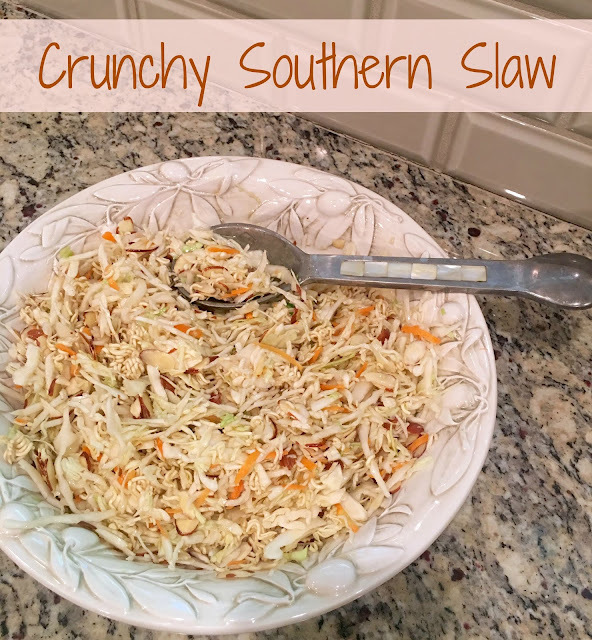 To me, slaw is just something that screams southern. It reminds me of local BBQ restaurants and Sunday Suppers at my grandparents. While I don't always care for the traditional southern slaw I do love the other varieties I've had over the years. Some of my favorites were Blue Cheese Slaw from a restaurant we used to frequent when we had our lake house and Granny Smith Apple Slaw that I recently had on our trip to Key West. Delish!!! One other favorite that I've actually made myself is a recipe I got from my mother in law years ago. The secret ingredient is Ramen noodles. Crazy, right? I promise it's good though. 1. First make your dressing. Combine oil, sugar, vinegar and seasoning packet from Ramen Noodles. Mix well and refrigerate. 2. Break Ramen Noodles into small pieces. 3. Combine noodles, slaw and almonds. 4. Pour dressing over slaw and toss before serving.